Interested in purchasing? Call now! The famous religious painter Carl Bloch was said to have dipped his paintbrush in his heart. As an artist, I relate to that statement because painting for me is a way to turn myself inside out and share what is there on canvas. Sometimes I see things that are so painfully beautiful that I can find no adequate words to describe them. My art has become a spiritual language where I can express myself without speaking. And hopefully those who view my paintings will feel what I am trying to say with no words passing between us. I have found that it is through visual imagery that I can best reveal my passions. As an artist I am more interested in painting my emotional reaction to a subject than in creating a photorealistic rendering of it; consequently my paintings lean more to impressionism than realism. I tend to work in an abbreviated style where the suggestion is more important than the completed statement, and where the parts or details are sacrificed for the good of the whole. I’ve learned that the less I give away in my paintings, the more people seem to read in them. To me, there is more poetry in an image when not every detail is spelled out and the viewer is allowed to solve some of the mystery. I love to capture the abstract patterns of light and shadow in the subject as, paradoxically, I find this creates a more realistic image when viewed from a short distance. I generally paint things that I am close to, both in distance and in feeling. I am not about depicting vast expanses of nature, but rather of close, intimate corners of personal spaces. Any subject is game for my brush as long as it is beautifully lit. In truth, light is always the subject I find most exciting, as anything it touches is enhanced in depth, dimension, vibrance, and beauty. This is the spiritual implication art has for me. I consider it the greatest of privileges to be an artist–to notice the grandeur in small things around me, to celebrate them on paper or canvas, and to share my passion for life though my artwork. I grew up in Loveland, Colorado, and drawing has been second nature to me for as long as I can remember. My primary and secondary education focused on an intensive course of study in science and mathematics. Aptitudes in these areas meant I was encouraged to pursue a career in engineering or computer science, but despite the rigors of my schoolwork, I still sketched whenever I could, and served as the staff artist and cartoonist for my high-school newspaper. After graduating high school, I spent one term at Carnegie-Mellon University studying applied mathematics without much success. It became clear at that point that an engineering career was not the direction I wanted to go. I decided it was time to follow my artistic talent rather than the advice of others, and I enrolled in the arts program at Colorado State University. That experience would have its own frustrations, as my tendency to want to work in a traditional, representational context was discouraged and disparaged by the faculty. Having resolved to build my life on my own terms, I stuck to my guns, and focused my coursework on graphic design and illustration, areas where traditional skills were emphasized and valued. I also attended regular figure drawing sessions. It was during my time at CSU that I began backpacking with my wife in the desert country of southern Utah. The staggering beauty and power of the canyon country inspired me deeply, and transformed what to that point had been only a passing interest in the landscape into a driving passion. I earned my BFA in Graphic Design in 1992, and my path slowly unfolded before me over the next few years, as I married, moved to the small mountain town of Carbondale, Colorado, and tried to establish myself as a serious artist in the local galleries. I saw almost no commercial success, and was, ironically, using my science background to hold down a job as a chemistry lab assistant at Colorado Mountain College. Fortunately, in 1995 I was able to take a two week workshop with noted painter Skip Whitcomb, and it is fair to say that at that point everything changed for me. Skip introduced me to the practice of plein air painting and got me working in oils. He also opened my eyes to the art world that I had never glimpsed in college – a world of artists both in America and abroad who had continued in the traditional ways of painting long after the “isms” of the early 20th century had taken root. 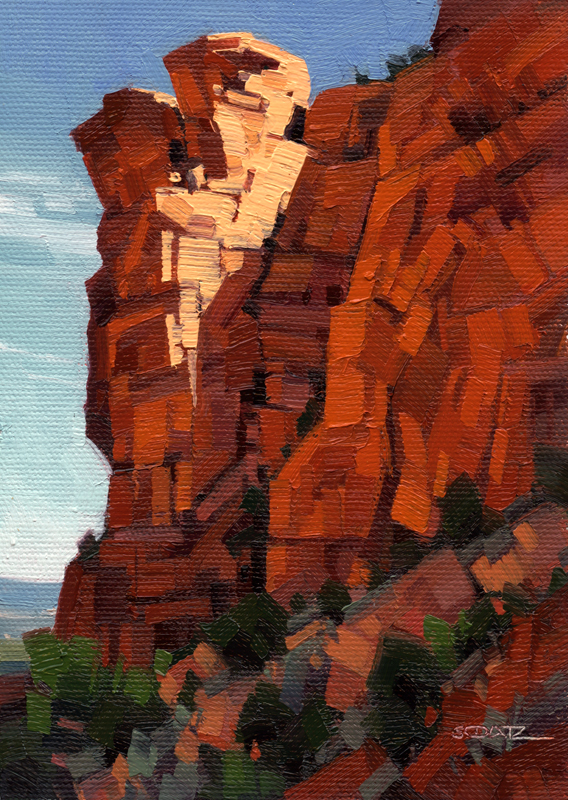 Armed with new tools and renewed enthusiasm in my work, I embraced plein air painting wholeheartedly. It has been my focus since then. Over the next three years I painted each and every day, maintaining a rigorous and disciplined approach to my work and producing approximately 2,100 field studies. Along the way I had the privilege of working with and learning from some other wonderful painters. When I felt my work was good enough, I re-entered the marketplace, and quickly began to see some sales and win some awards at local and regional shows. I had my first solo exhibition in Denver in 1999, and I have been earning my living through my brush and palette ever since. I view my work as a distinctively personal journey of discovery. I’m not painting to please others, or satisfy some market niche. The landscape is my obsession, and it is my passion and privilege to be able to tune into forces greater than myself and by way of imagination create something that contains an evocative glimpse beyond the surface of subject and artist and into the essential character of both. Interested in collecting? Call now!